Action Figures has been out for a little less than a week now, and I certainly can’t complain about the response. More than a dozen copies sold in the first few days, and a lot of friends shared the launch announcement, which I hope will generate future sales. Ah, but this is where the real work begins for me. Writing and prepping the book was the easy part, comparatively; now I need to push it so people outside of my circle of friends buy the thing. Fortunately, I have an edge: my experiences in the newspaper industry and in publicity for the renaissance faires at which I’ve worked have prepared me well for the task of publicizing my book, and that effort is now underway. The first things I did were to create author pages on Amazon.com and Goodreads, which are a bit more passive publicity tools; aside from blog posts that auto-share on those pages, these will sit on the Internet, largely untouched, and show up on searches. The next step: write up and send out a press release. My former place of employment, the Falmouth Enterprise, got the first one, and as soon as something runs there, I’ll be sending the release out to other news outlets covering my home town. I plan to print up copies of this mailer in small batches, as finances allow, and send it out to indie bookstores to let them know this book exists and hey, maybe they want to carry it. All these things have one end result in common, besides selling copies: generating word-of-mouth buzz, which can be as effective, if not more so, than any sort of formal advertising/publicity campaign. Thankfully, my friends are both very literate and very talkative. 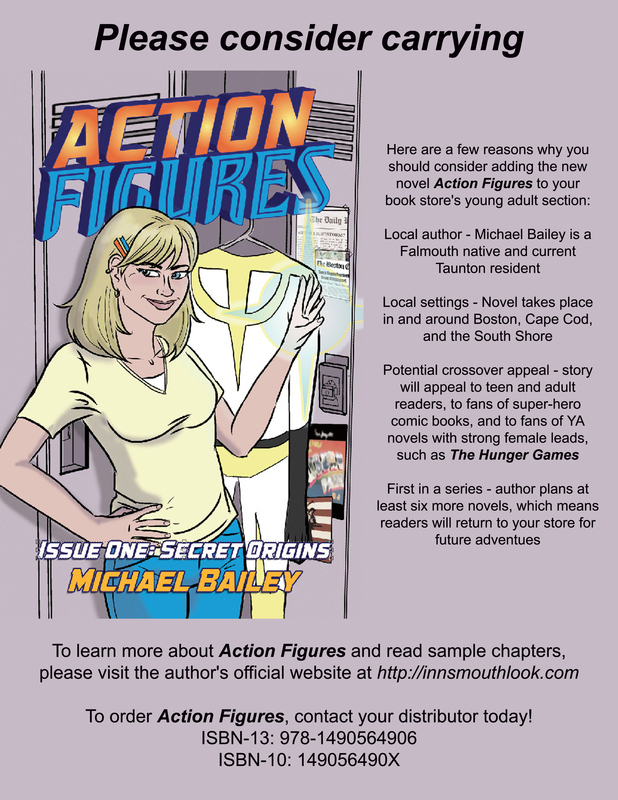 Action Figures – Issue One: Secret Origins – NOW ON SALE! Firstly, seek out and join every writing, literature, book group, and sci-fi/fantasy/comic site you can find, and promote this relentlessly! Since so many people nowadays do a substantial amount of purchasing through websites, spreading that Amazon link as far & wide as you can should translate into sales, even if only one person out of a thousand buys. The “look inside” option took a few days to kick in, but it’s running now.